Al Maryah Island, a Mubadala development and the capital’s business and lifestyle destination, unveiled various plans for expanding its portfolio of business offerings at the ongoing Cityscape Abu Dhabi 2018. As one of the capital’s most prominent hubs, Al Maryah Island’s diverse portfolio of real estate and infrastructure developments is already contributing to a strong foundation for Abu Dhabi’s future growth. It has been designated the world’s newest international financial centre – and combined with its ever-expanding luxury retail and dining destinations, premium hospitality offerings, and world-class healthcare, the island has also become a coveted lifestyle destination in which to settle down. With its strategic location between Abu Dhabi’s existing downtown, new business, and residential districts, its growth is predicted to provide 50,000 jobs and be home to a population of 30,000 people. The newly-completed infrastructure offers access to countless leisure facilities – from cycle paths and pocket parks to more – including its now-famous waterfront promenade, and a comprehensive multi-modal transportation network spanning both rapid metro and transit lines and bus and water taxi transits to complement its 13-bridge roadway network, in addition to a vast number of air-conditioned pedestrian corridors and shaded colonnades. 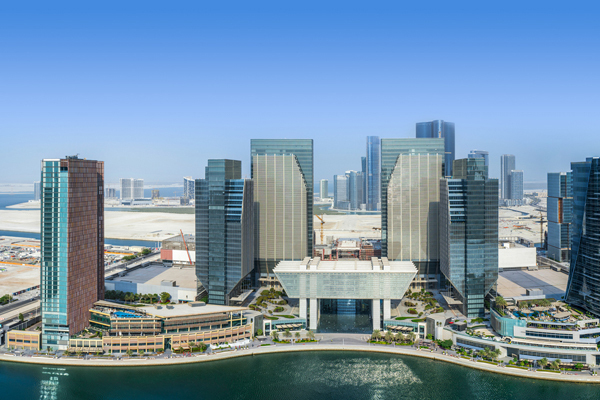 Combined with its network of open space plazas, this high-quality interconnected public realm, Al Maryah Island’s plot sales make for a profoundly attractive option for buyers and developers. In line with its constant stream of exciting new developments and fast pace of growth, Mubadala’s Real Estate and Infrastructure unit introduced the Plug-and-Play concept. Representing one of the island’s latest offerings, the concept gives prospective businesses the opportunity to take on fully-fitted, furnished private micro-offices available on flexible short-term leases, said the company in its statement. According to Mubadala. the leases will cover all-inclusive rent, that incorporates utilities, chiller charges, and even cleaning charges, as well as electricity and data cabling that has already been set up to begin instantly upon the entrance of a new tenant. This allows prospective tenants to move in and start operating right away upon signing, eliminating any wait time or the often-length processes often required through a new office setup, saving these business valuable hours and the costs associated with that. Ali Eid Al Mheiri, the executive director of the Real Estate and Infrastructure at Mubadala, said: "The micro-offices are built to the highest of standards, with the most advanced and high-quality infrastructure that has been approved by the Abu Dhabi Urban Planning Council (UPC)." "As responsible investors, we take pride in the fact that the office buildings and other leased spaces are Grade A, turn-key locations – some of which are the first buildings in the UAE to be awarded the prestigious Leed Core and Shell Pre-Certification by the US Green Building Council. We are continually evolving our business and leisure offerings," stated Al Mheiri.